Only use mobile phones and other devices, even with voice commands, when it is safe to do so, and use extreme caution. Driving while distracted may take the driver’s focus off the road, which can result in loss of vehicle control, accident and injury. The driver’s primary responsibility is the safe operation of the vehicle. These are the same types of warnings that we get with GPS devices and MapQuest directions. The MyTouch system is infinitely more hazardous, however. Why’s that? Well, let’s extend the Star Trek analogy for a minute. Remember the Enterprise from The Original Series (TOS)–the one with Kirk? 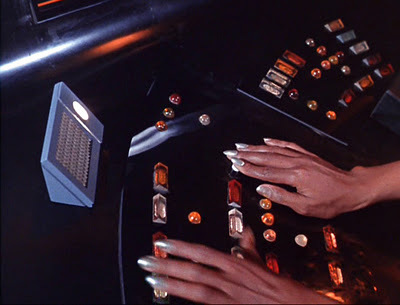 That starship had buttons all over the place. Big, colorful, buttons coming out of every flat surface. It’s like a keyboard–you can concentrate on one thing, say, the viewscreen showing that Klingon battlecruiser making a beeline for you, while simultaneously firing phasers, all without having to look down. Fast forward 150 years to Star Trek: The Next Generation (TNG)–the one with Picard. No three-dimensional buttons. Flat panels everywhere. Like the Ford MyTouch, the screen changed depending on what buttons you pressed–like an iPad. Hit this button and its a word processing program with new buttons to push; hit that button and it’s the latest iteration of Angry Birds with all new buttons in different places. It must have been more difficult to do two things at once in TNG–you have to pay close attention to the “keyboard,” or else you might do something stupid like hit the self-destruct button or steer the ship into that asteroid over there. Now, space is vast, and the chances of Wil Wheaton hitting another ship in a head-on collision while texting jokes to the Reading Rainbow guy are remote. On the road, however, those dangers are much more likely. A lawsuit against Ford for some future hypothetical accident could work in one of two ways. Say Patrick Stewart (yes, we’re still working the Star Trek references) is driving his 2012 Ford Explorer. He’s using MyTouch to get news and stock quotes while warping (at the speed limit) down the road. Well, he veers off the road and hits a tree. He files a product liability suit against Ford, basically claiming defective design. In states like Maryland, contributory negligence is likely to be a problem, but under these facts I could see an automobile accident lawsuit being successful at least some of the time. Let’s put Patrick Stewart back in the captain’s chair for the second example. Same situation, but he veers into oncoming traffic, hitting William Shatner. William Shatner could sue Patrick Stewart, who could implead Ford. Or, William Shatner could sue Patrick Stewart and Ford directly. An interesting issue is whether Ford owes a duty to William Shatner, who was not driving a Ford in the example. In this day an age, I think most courts would accept that as a jury question. As much as I love technology, it is really a hazard in the car. Please–go boldly, but safely, down the road.